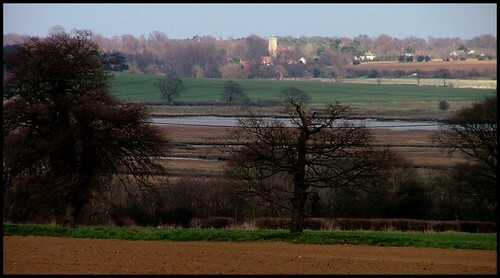 Shottisham is a lovely village right at the heart of the Bawdsey Peninsula, an idyllic spot. The Peninsula is relatively well-served for pubs, but the one here is generally thought of as one of the best by people who know about that kind of thing. The church is a charming 19th century rebuild, like its near neighbours Alderton and Sutton, and there is a lovely view of it from another Vistorianised church at Hemley, on the far side of the Deben. 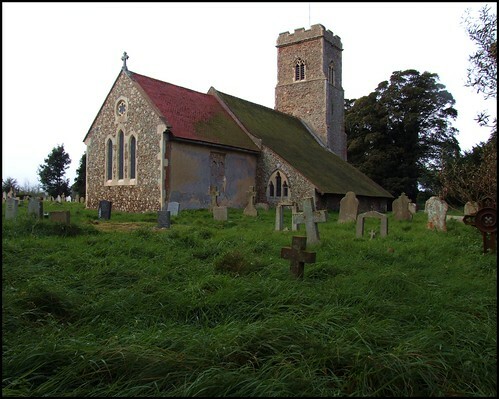 The restoring architect was Edward Hakewill, who was also responsible for Rushmere St Andrew, the Victorian work of which has some superficial internal similarities with this church. The Hakewill signature of a north aisle slopes down to within 5 feet of the ground, giving it a rather dark ambience, much in the manner of his north aisle at Rushmere, before the 1960s transformation. We came here in October as they were setting the place up for the Harvest Festival. These Festivals were introduced by Tractarian-minded Rectors a little over 150 years ago, and should not really take place until the end of the first week in October, when all is safely gathered in ere the winter storms begin. There seems to be a fashio to move them forward to early September, possibly to coincide with National Heritage weekend, when the days are still relatively light, and the insides of churches reasonably warm. I was glad that had not happened here, and they were still doing it properly. Some parishes treat Harvest Festivals as a straw to clutch, one of the Blessed Trinity, along with Remembrance Day and Christmas, when outsiders might be attracted into Church, but I got the impression here that St Margaret's is a busy little place, and the parishioners were doing it for themselves, which is also just as it should be. As we stood in the sloping graveyard, the sun began to come out. The medieval tower is rather attractive, being elegant, and its flintiness softened by the intermingling of septaria. We stepped in through the south porch, picking our way over the neatly piled syringia, forsythia and fat green marrows. A few years ago, I had spent a pleasant half an hour here chatting to a churchwarden about the interior. He told me that much of the work from Hakewill's time has now been renewed, with a new ceiling and floor boards in particular. The floorboards beneath the organ had rotted away to such an extent that it was literally hanging off its pipes. The best feature of the inside is a fine roodloft stair set into a window, as at Whepstead and Barningham. This one has a curious piscina at its foot, to serve a nave altar. Another fascinating detail is that the octagonal Purbeck marble font, on its modern arcade, is set on what appears to be an altar mensa slab. There is also a charming brass set in the nave floor. It remembers Rose Glover, wife of the Rector, who died in 1612. Charmingly, the brass is incised with a picture of a rose and the verse As wither'd rose its fragrant sent retains, so being dead, her vertue still remains. Shee is not dead, but chang'd. The good ner dies, but rather shee is sun-like, sett to rise. Curiously, the dedication of this church was also given in error to the church at Chattisham, on the other side of Ipswich, after 18th century antiquarians confused them; the CofE revival of dedications in the 19th century failed to rectify this mistake.